You heard correctly camper, it is all about you. You don’t often hear that, do you? Well, it is, when it comes to the Union of Reform Judaism (URJ). 6 Points Sports Academy is a tight-knit family. 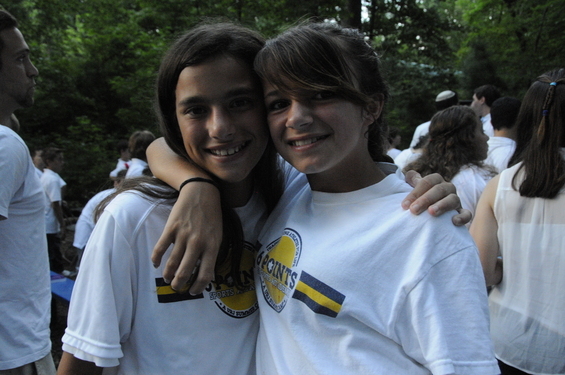 We’ve grown together for the past four summers sharing our passion for sports and Judaism. In less than 175 days, we will home again for our 5th season. 6 Points Sports Academy is a part of another tight-knit family, the Union for Reform Judaism. Just as you, our campers, come from all over North America, the URJ is the umbrella organization encompassing Reform Judaism of North America. 6 Points Sports Academy has 14 siblings in the URJ camping division and we are one of three specialty programs. Our older sister is Kutz Camp for High School Leadership and the babies of the family are 6 Points Sci-Tech, kicking off their inaugural summer 2014 on the campus of Governor’s Academy in Byfield, MA and Harlam Day Camp in Byrn Mawr, PA. Of course, we have our other older siblings, URJ Camp’s Eisner and Crane Lake here in the beautiful Berkshire mountains of western Massachusetts. There is a camping experience for everyone! This growth in our camping family is one example of how it is all about you. The URJ is devoting valuable resource, people, money, and time, to enhance your Jewish experience. Whether your passion is sports, leadership, arts & crafts, singing, robotics, nature, so on….the URJ wants you to have a home where your interests and hobbies coexist with, and even strengthen, your Jewish identity. This is true for both your summer experiences, as well as all year round. The URJ is celebrating 75 years of North American Federation of Temple Youth (NFTY), an opportunity for Jewish high school students to learn together, to participate in community service, to pray and to have TONS OF FUN. It’s hard to describe the רוּחַ (ruach) ones feels being in the NFTY family. I hope you all have the opportunity to experience NFTY. At the recent 2013 Biennial convention in San Diego, CA, the focus continues to be about you. The URJ is expanding NFTY to include 6th to 8th graders. This is an exciting opportunity for the URJ to partner with congregations to make that vital bridge for post-B‘nai Mitzvah continued involvement by our youth. Think of it as an extension of the amazing experiences you have at camp, all year round. This is one of the many new initiatives that the URJ is embarking to make it all about you, to let you be Reform Jews today and tomorrow. “Today‘s teens, like the biblical teens, are each unique. Genesis is filled with adolescents trying to find themselves through the painful struggle of spiritual, emotional, physical, and moral growth. So also today: Our youth need communities that are safe, accepting, vibrant, joyful, and grounded in Jewish spiritual values. And our offerings must stretch across the widest spectrum to draw in Rachel and Leah, Joseph and all of his brothers. Let me be specific: Currently there are around half a million young Jews between the ages of 13-18 in North America. Most of them are not actively involved in Jewish life. When we were together in Washington, D.C., two years ago, we squarely faced the staggering statistic that 80% of our Movement‘s young people were out the door by 12th grade. I pledged to you then that our number-one priority was to turn that wide scale disaffection into deep engagement. See, it is all about you – today, tomorrow, the summer of 2014 and wherever you lead us into our Jewish future.